The MR12 by Meraki was created to easily have a reliable wifi internet signal that covers the entirety of small businesses and private teleworkers without losing connectivity. The aesthetics of the MR12 will make it fit right into any office space, home, or storefront. The thin flat look of this AP device makes it almost disappear into the background, making it nearly unnoticed. The narrow build of the MR12 can save space and because of this can be placed nearly anywhere. It can also be mounted on a wall, it comes with all equipment and hardware needed for a wall mounting. The sleek good looks of the MR12 isn’t the only reason to buy this AP device. Like many of the new AP devices that are coming out as of late, the MR12 is a single-radio 802.11n with up to 300Mbps. The server that is sending to you may only be working at 100Mbps, which makes the MR12 match the speed and keep things running as far as possible. Some devices have even been designed to run at speeds of over 400Mbps, but it is pointless if the original server sending you the internet is only running at 100 Mbps. It weighs only 1 pound and is only 1″ thick. It’s shape is a 6″ by 7″ rectangle. The hardware with the MR12 comes with a 2 x 2 multiple inputs and multiple outputs making set up convenient and easy, and allowing for two spatial streams. The MR12 works great on both a 20 and 40 MHZ channels and utilized beamforming and maximal ratio combining to maximize the performance and capabilities of the MR12. It shows six LED indicators letting you know the signal strength, ethernet connectivity and 1 indicator for power. The antenna is built in and omni directional, making for a strong and reliable signal. The security features are the big difference between this AP device and the the many others in the market. It features an integrated firewall policy to identify guests and isolate them so they can’t cause harm to your system or computers. It makes use of either a WEP or WPA password and even goes as far as having a TKIP and AES encryption software. It also sports the rare 24×7 wireless intrusion detection warnings. If someone is able to hack your wifi signal, you will immediately benotified of the intrusion. One of the best physical features of the device is the built in security. A security screw keeps the device sealed from unwanted tampering, an anti-tamper cable bay that makes tampering with the cables going to the unit almost impossible. When put together with the concealed mount plat, it make the device nearly impossible to tamper with if you don’t own the unit. The MR12 has proven itself to be one of the best AP devices on the market, but there are a couple small catches, such as the price. 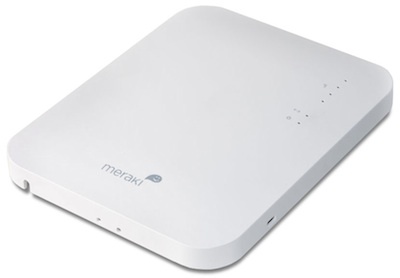 This unit is meant for small businesses, home offices and teleworkers, making it the most affordable of the MR series by Meraki, but still costing $399 for each unit. Considering all the features and security of the unit, it is well worth the price, but it does require one other purchase to legally own. Since this device is made for professional use it requires a license to operate. A one year license costs half the price of the unit at $150 for an AP license. A 3 year AP license will run $300 USD, and a 5 year license will cost $450. On Amazon.com the starting price drops from $399 down to $279, on Ebay the MR12 starts at $199 USD, making this unit highly affordable if you want it new or used. Users of the MR12 boast its reliability and security because it does not require any additional additional hardware or software. Because it is cloud-managed the MR12 has strong cloud security that enforces access control policies for all users. Authorised users gain easy access, while unauthorised users are quarantined through the use of fine-grained access control. Setting up the MR12 is easier than most other similar devices. The users do not have to worry about any reconfiguration of the LAN.Installation takes just minutes, and trouble shooting is intuitive, even for those who do not have networking skills. There are online tools that take the users step-by-step through any possible problems they may encounter. If you need a reliable, safe, and easy to set up AP unit, then the Meraki MR12 has hit a home run for you and your small business or home based office.